For an inexpensive range session with your .40 S&W pistol, it's hard to go wrong with this Russian made ammunition from Tula. Each cartridge in this box of 500 fires a 180 grain bimetal jacketed bullet. These cartridges use non-corrosive Berdan primers and non-reloadable steel cases with polymer coatings for more reliable cycling. Their steel components may make them unsuitable for some ranges; check before ordering if unsure. 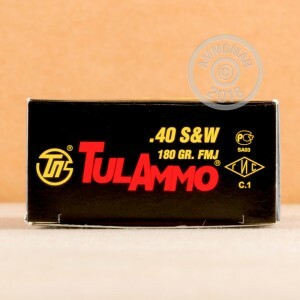 AmmoMan.com is a great place to pick up 500 round cases of ammo like this one. All orders over $99 ship for free! This ammo jammed my gun pretty bad. It did not smell like gun powder either. 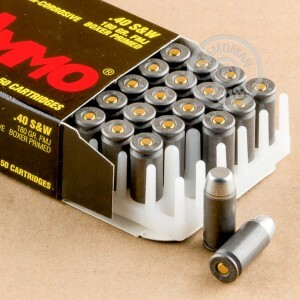 The service from ammo man was great but my recommendation would be to stay away from this particular ammo. Many jams. Jams with full clip plus one in chamber. Need to shoot slow to avoid jams. good for range, anything else I wouldn't depend on them. Had three jams in 50 rounds. I would not buy them again. Ammo man was great, free fast delivery. shot a few 100 out of my Ruger p944 and it has in past been picky about ammo, no issues, shot slow and fast. Ammo was the newer zinc plated rounds that they changed to. Good buy for price. Ive fired about 100 rounds of the 500 I have. I am shooting a Ruger SR40c. Ive had 1 shell out of every mag get stuck and not eject. The ammo arrived the next day and worked great. I shot about 400 rounds, only 1 misfire. I had a lot of loading issues. These rounds didn't fit snug inside of the magazines, I kept have to readjust them. Other then the 1 misfire, and loading issue. This ammo is great for just shooting a target and having fun. Recieved my order in two days! Fantastic! The Tula ammo is firing great so far. Put about 200 rounds through my Taurus PT24/7 G2 .40. Used 300 rounds without any problems on my glock 23. The gun was a bit more dirter, thats about it. This is a great product for the price I will be ordering more. Very good plinking ammo had no ftf in my .40 Taurus. No duds either. This is not high end defense ammo it is good for targets at the range at a very good price. The ammo shots great, no problems at all. I did find out however that the coating on the steel casings leaves a build up on the barrel! Good shooting, bad build up on barrel. These rounds are great for the price. That said, they will be fine for plinking. I shoot 300 rounds and had many failure to feeds with my Glock 22. I believe it was due to the steel casing. I order these Tula cartridges for a 40 cal. Beretta and the flat nose bullets kept jamming the gun. I think, specifically for this gun, that flat nose bullets are not Beretta PX4 friendly. Otherwise, the cartridges fired flawlessly. Also, note that some gun ranges do not allow steel shell casings.